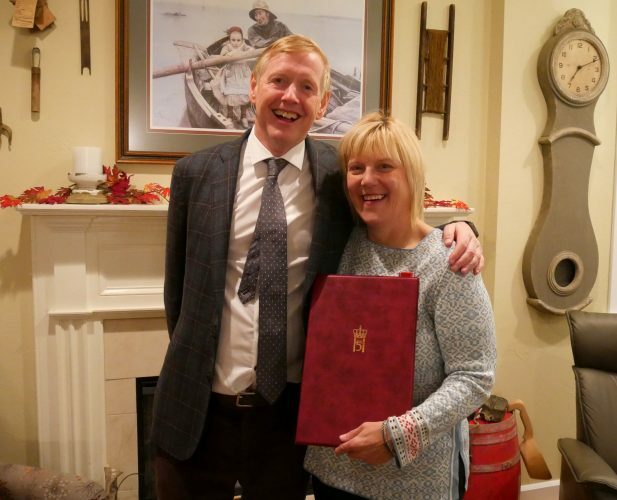 A Petersburg resident has been recognized by the King of Norway for her dedication to promoting relations between Norway and the U.S. The Ambassador of Norway to the United States was in Petersburg last week to hand out the Medal of St. Olav. A handful of Petersburg residents are gathered at Glo Wollen’s beach front home to have a cookout. Wollen is the current President of the local Sons of Norway lodge and she’s also the town’s Harbor Master. At this point, she had no idea she’s getting an award. As far as Wollen’s concerned, she’s just hosting important visitors. The last time the Norwegian Ambassador visited Petersburg for the Little Norway Festival in 2016 Wollen also hosted a BBQ at her place. Southeast Alaska’s Senator Bert Stedman was also there. People were socializing in the back yard while local black cod, salmon and shrimp are grilled over a fire. Soon, people are called around the deck because Ambassador Kåre Aas wants to publicly thank Wollen for the hospitality. He says he is also here for another reason. 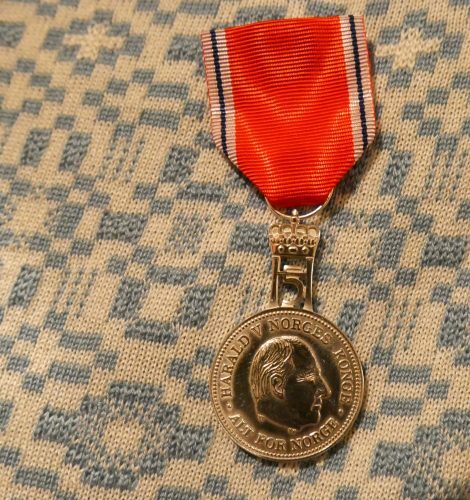 The medal is round and silver and hangs from a red, blue and white ribbon. Wollen also receives a diploma. Aas said the medal is given to Norwegians or foreigners who have been working hard to strengthen the relationship between Norway and another country — in this case, the U.S. He said he nominated Wollen for the medal. After the award is given, Wollen received hugs from friends and poses for photos. Aas said the king’s medals are seldom given out, maybe one a year to Americans. Aas said that based on this recognition he believes that when Wollen visits Norway – which she hopes to do – she will be able to meet the King of Norway himself. Wollen herself didn’t give any speech after receiving the award but besides wearing a new medal on her chest, she also had a beaming smile on her face.